Russell Jordan is fairly new to the cane industry. After spending 14 years under car bonnets as a mechanic, Russell was determined to try life on the land, and in 2001 bought a 120 hectare farm in the Burdekin region. Russell and his wife Susie own and operate their cane farming business near Giru. In recent years he experienced inadequacies in the management of various contractors he engaged to assist with his farm operations. After working with workplace health and safety plans in his previous career as a mechanic, Russell saw an opportunity to improve safety practices and plans on his cane farm. 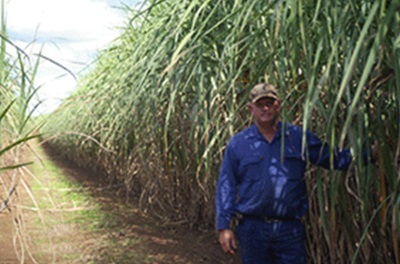 In 2010, Russell Jordan introduced a contractor management program to his cane farming operations. The program was designed to be integrated with his CANEGROWERS Health and Safety Management System, “Ten Steps to Safety”. In the past, many business outcomes were discussed and sealed with a handshake. Russell identified this as a shortfall in his obligations to maintain a safe work environment. A more formal process to engage contractors was needed. The Jordans decided on a documented procedure that would require a ‘safe work contract’ which highlighted the responsibilities of all parties in the contract. Russell Jordan on farm near Giru, in the Burdekin region. Contractors are also required to submit a safety plan for their operations that contained emergency response planning and proof of a current workers compensation insurance policy and when needed proof of delivery point induction training for all cane haulage workers. Russell also encouraged consultation with contractors and their workers by discussing known hazards as well as showing their key locations with a simple property drive through inspection. “After the induction, the contractor, all of his drivers and I sign the document,” he said. Russell commented that even though he had a safety management system, it was a living document and needed to be supplemented with new ideas and reviews of the processes already in place. Since buying two more farms in the region, Russell has developed safety plans for each of these separate properties as each farm is different, and has compiled them all into one handbook. “It took a little effort to set up initially, but now each year I just review each farm’s safety document and make small adjustments if necessary,” he said. Brothers Darryl and Lester Cronau farm 276 ha of cane and manage a total land area of 375 ha at Pilerwa and Yerra, south-west of Maryborough. This year they expect to harvest 15,500 tonnes of cane. One of their most significant achievements in improving their farm’s soil health has been the design and manufacture of compost making and spreading equipment. The 3-grower D.A.G group, of which the Cronau brothers are included, received SRDC funding assistance of just more than 50% of the $93,000 project to design and build a compost turner and test compost application rates. They also received assistance from the federal government’s Reef Rescue fund to design and build a compost spreader. In previous years, the Cronau family have grown pineapples in rotation and have seen the benefit of planting into pineapple residue. They are now out of the pineapple industry and have been making compost since 2008. “At the moment we use mill mud, pine sawdust and chook manure to make the compost and we are doing trials as part of the SRDC project to determine optimal application rates,” said Darryl Cronau. Using a filter press means that there is generally no need to add any water during the composting process as the mixture heats up well. They need to turn the compost two to three times a week to keep the temperature down to the desired 55– 65°C. In time the group hopes to source city waste in the form of green waste and bio-waste. 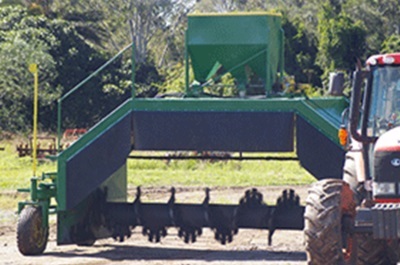 The compost turner has several unique features incorporated into its design, including the ability to add micronutrients while mixing the compost The complex articulation mechanism allows the tractor to turn without needing to turn the turner and it can be transformed into a trailer to be moved along the road between farms. “Having the micronutrient box as part of the turner means we can custom-build composts to meet the specific nutrient needs of a paddock or crop,” said Darryl. The group’s unique compost applicator can apply 9–12 t/ha of compost into the ground, through the trash blanket. “The compost is 2% nitrogen, 2% potassium and 1.5% phosphorus and at this rate easily supplies enough nutrient for the cane, remembering that half to one-third of the nutrient is available to the cane in the first year. Lester, Darryl and Bradley (Darryl’s son) Cronau use compost to improve their cane farm’s soil health. The application rate trial we have set up will fine-tune the rates needed to have a lasting beneficial effect through the cane ratoons.” “We apply the compost using GPS to place it along the soybean planting rows. It’s like planting the soybeans into potting mix,” says Darryl. The D.A.G compost turner rotor runs at 300 rev/min and the turner moves forward at a rate of 200–600 m an hr. Following the previous cane crop, soybeans were planted through the trash and compost was applied. 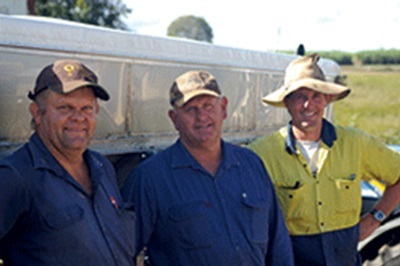 For many years, Tony and Katrina Chapman, along with son Mitchell and Tony’s father, Frank, have been implementing a controlled traffic, minimum tillage farming system that incorporates a legume crop in rotation with cane on their Bundaberg farm. Until fairly recently, soybeans and peanuts have been their legumes of choice but after a few years of field testing, Tony has found that he can also successfully grow field peas in winter. When looking for another break crop option, Tony had three main criteria. The new crop needed to be a legume, to grow in winter and not be a weed in cane. He also hoped to find a crop that would provide an economic return. His research led him to field peas, which are generally considered a crop suited to more temperate regions and are grown extensively in southern NSW and Victoria. The initial field trial was successful enough for the Chapmans to grow more the next year and they were able to harvest and sell the grain. After working with University of Sydney plant breeder Steve Moore and BGA Agri-services agronomist Simon Andreoli for a few seasons, Tony has developed a good understanding of the crop’s requirements in the Bundaberg area. With increased crop management knowledge Tony is now confident that each crop he plants will yield a harvestable crop. Tony usually grows a plant crop and three ratoons. Cane cut early in the season is often sprayed out, and a 1.2 m bed is zonal tilled to provide a seedbed for soybeans, which are planted in November or December, without disturbing the wheeltrack area. Field peas are direct drilled into the soybean stubble and after the peas are harvested in August, Tony plants cane again. 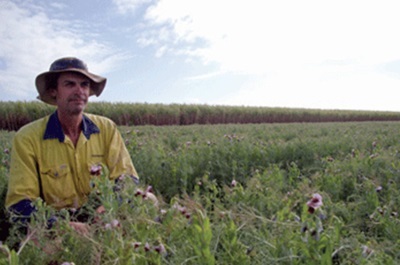 Tony Chapman uses field peas as a break crop on his Bundaberg cane farm. 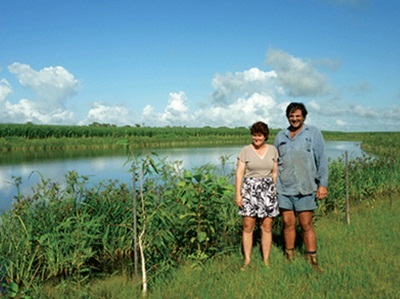 Using legumes as a standard part of their farming system, the Chapmans have been able to reduce the nitrogen applied to plant cane to 80–120 units. “The biggest difference we have noticed is the stability in production,” says Tony. Timing of each phase of the crop rotation is critical and incorporating a new crop without much agronomic information for the region being available has presented some challenges. 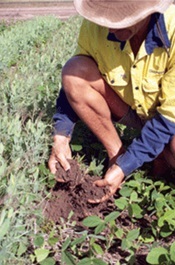 All of the ‘mistakes’ have been a useful part of the learning curve and have helped build up a significant knowledge base for winter legumes in coastal farming systems. “Field peas are a low input, low return crop,” he says. Helicoverpa control is important in field peas and Tony has found the biological controls are generally fairly effective. The larvae cause significant damage though, downgrading the grain quality, so harder chemical options are used if required, unless the crop is intended to be turned in as a green manure. Field peas are also susceptible to powdery mildew in the late stages of podfill so Tony chooses varieties such as Yarrum, Willana and Maki that have greater disease resistance. 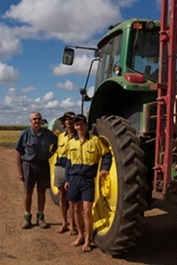 Frank, Tony and Mitchell Chapman on farm in Bundaberg. Towering above the cane fields at Murray Upper, just south of Tully Township, is a contraption that has allowed sugarcane grower Peter Vecchio to save time and chemical use. This contraption, also known as an overrow sprayer, is going a long way in assisting Peter to save money and precious time on his cane farms, scattered across the Tully region. Built from the ground up by Peter and employee Kevin O’Kane, the spray rig has its base on a John Deere 6400 tractor, and is fully GPS automated, rate controlled and auto-steer. Part Reef-Rescue funded, the overrow project is not the first time the Vecchios have been involved with the federal government program. In the first year of funding, through natural resource management group Terrain, they set up their tractors for GPS and also set up a chemical tank with a boom for rate controllers and individual spray sections (swath control) – reducing chemical use. As Peter explains, the GPS computer program also helps with record keeping. Peter Vecchio (far right) with his son Cameron (left) and Kevin O’Kane (middle) in front of their new overrow sprayer which is saving money and time on the Vecchio’s Tully farm. Peter says they also put a rate controller on the fertiliser box the first Reef Rescue year. Peter says the build didn’t actually finish until 2012, and the Vecchios were able to use the sprayer during some of the 2012 season – where it was used to spray 80 hectares (200 acres). “We averaged about 115 acres [46 hectares] a day – it went really well. We managed to spray 450 acres [182 hectares] comfortably in four days – in daylight hours,” says Peter. Highway rolls through the bayous and cane paddocks of the Murray Flats, the landscape changes rapidly as the unmistakable jagged chiselled outline of Hinchinbrook Island takes shape on the horizon in the direction of Cardwell. It’s the mountains of Hinchinbrook that influence the weather along this section of the Cassowary Coast, says Bilyana cane farmer Brian Machan during a tour of his 140 hectare cane farming holding. The season’s ideal growing conditions haven’t just been to the liking of the sticks of sugarcane reaching for the sun in the paddocks around Bilyana. Broad-leaf weeds, grasses and, in particular, vines, have found the combination of reasonable rainfall and significant bursts of sunshine perfect for growth. The variety of invasive threats call for innovative solutions to manage that fine balance between maintaining productivity and farming in an environmentally sustainable manner, while minimising the impact on the Great Barrier Reef lagoon. In addition to the more common pests such as guinea grass, it’s the bind-weed vine red convolvulus that has proven the biggest challenge to manage in recent years. The pest vine is particularly prevalent on the more exposed end rows in the cane paddocks, where it can wrap around and kill cane. If left unmanaged, infestations of red convolvulus have also been known to quickly take hold in the leguminous bean crops which Mr Machan has planted in his fallow paddocks. Difficult to eradicate due to its hardiness and the capacity of its seeds to survive for many years in soil, red convolvulus is best controlled with a combination of glyphosate for knockdown using a shielded sprayer in the inter-space between rows, and 2,4-D, which Mr Machan applies periodically with a boom sprayer. “We use the 2,4-D because vines become a big problem, a really big problem – with red convolvulus moving into the area,” Mr Machan said. Nearly four years ago, with the assistance of funding provided through Reef Rescue, Brian Machan made the strategic purchase of a shielded sprayer from GC Agriculture in Armidale. “Some of the paddocks, with a boom spray; we have to spray three times to stop that convolvulus. It’ll actually kill cane, it wraps the leaves up and blocks the sunlight, it’s been here about four or five years and it’s getting spread more and more because mainly we didn’t know how to manage it. A keen adopter of innovative farming practices, particularly those methods that deliver a healthy soil profile and minimise the presence of residual herbicides in the environment, Mr Machan has teamed up with the federal government’s Reef Rescue project to help deliver solutions that are in-step with environmental best practice. Nearly four years ago, with the assistance of funding provided through Reef Rescue, Mr Machan made the strategic purchase of a shielded sprayer from GC Agriculture in Armidale. It’s a purchase that, over time, has paid dividends both in terms of reduced herbicide costs and improved environmental outcomes. “I used it on the whole farm this year, it cuts down your use of residual herbicides so it’s virtually all knock down, no residuals. The shielded sprayer is set up to spray roundup into the inter-row spacing, four rows at a time, via the nozzles beneath the hoods and gramoxone among the stools via the nozzles situated above the hoods. Getting the process right has taken time and patience and there are plenty of handy hints which Mr Machan is happy to pass on to fellow farmers. 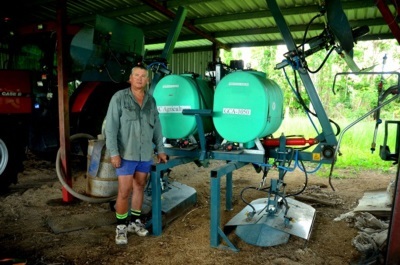 Low water volume proved to be an issue when the Bilyana grower first purchased the shielded sprayer and he was initially less than satisfied with the effectiveness of the gramoxone spraying with the new system. That issue was largely solved by placing a six hundred litre tank on the front of the tractor, in addition to the two three hundred litre tanks mounted on the spray rig, and increasing the volume of water in the gramoxone mix. It also meant some alterations to the spray nozzles to get the desired result. “I didn’t use it much in the first couple of years but once I got used to the way it worked, it was mainly the low water volume that was the issue,” he said. “The nozzles underneath are still standard they’re doing around sixty litres per hectare of water and these nozzles (above the hoods) were doing the same. “At the moment they’re doing about 180 litres per hectare. “Gramoxone needs to be wet and covered to work, where roundup only needs to be spots to work. The shielded sprayer is currently set for a 5-foot-3 inch row spacing, but the spacing can easily be changed to accommodate alternative plans. In the future, Mr Machan is considering changing to a 2. 2 metre row spacing which the shielded sprayer will easily be able to accommodate by simply repositioning the hoods. The use of an additional 600 litre tank also means there is less time spent refilling and, along with the relatively cheap cost of gramoxone and roundup, herbicide costs are reduced. “It’s putting out double what it used to and getting good results and you can do close on nine hectares without refilling,” Mr Machan said. 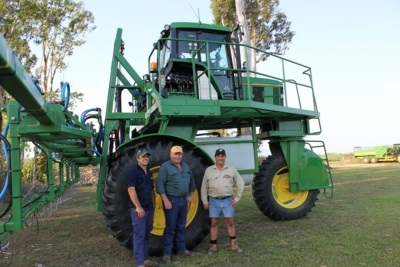 While some cane farmers question the use of shielded sprayers in the interrow spacing due to the potential of glyphosate damaging cane and leading to lost productivity, Mr Machan says he has seen no such issues on his farm. His advice to fellow farmers is to keep the tractor speed to about 8 kilometres per hour and be careful at the ends of rows where there is the most potential for spray drift. “I’m prepared to stick with it until I can see any evidence on my farm that it’s damaging the cane,” Mr Machan adds. Vince and Rita Papale, who run a family farm just out of Home Hill, have rolled out a number of projects to lift the farm’s productivity, water efficiency and to minimise environmental impact on their land and the nearby Great Barrier Reef. 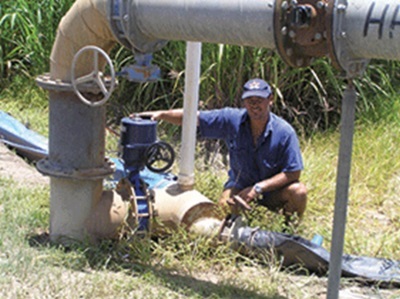 This project transformed four hectares of poorly-performing low-lands into a highly productive wetland which collects water from the farm’s cane fields, filtering it before it runs back into the river and out to the Great Barrier Reef. From this 98% of water is now recycled back on farm. The wetland teams with birdlife and fish, and had also increased the overall profitability of their farm. They have nearly finished a project to change row spacing from 1.4 metres to 1.6 to better suit machinery, and have employed the practice of splitting their fertiliser application, one just after harvest and one when the crop is out of hand, to avoid leaching in very wet events. Set at the heart of the Papale farm in the Burdekin is a wetland which epitomises the family’s approach to farming. Here they have transformed four hectares of poorly-performing low-lands into a highly productive wetland which collects water from the farm’s cane fields, filtering it before it runs back into the river and out to the Great Barrier Reef. With the introduction of the wetlands 98% of water is recycled back on farm. They say not only has it made a great family picnic spot, teaming with birdlife and fish, but it has also increased the overall productivity of their farm. “What really kick started the project was being hit with really wet years, where the area was swamped and we couldn’t grow cane in that area – and that hurt. After a lot of advice from the local natural resource management group, NQ Dry Tropics, we decided to take out the four hectares of low level country and reconfigured the paddock,” says Vince Papale. It wasn’t cheap, but with some vital assistance from the Australian Government’s Reef Rescue program, and by investing a lot of their own funds, the project has reaped its own rewards. “Today we produce the same amount of cane on less area and it is more reliable,” he says. The couple is also well-known for using their farm to help educate others about the importance of best management practice farming and its ties to sustainable and productive farming. Local school groups and the local council have come in to test the water. The results of water samples collected from the wetlands showed the diversity of invertebrates present – the wetlands water sample was literally teaming with life. By working on this diversification project, Vince and Rita have achieved an outcome that means their farm has increased profitability and its environmental credentials – a win for everyone.